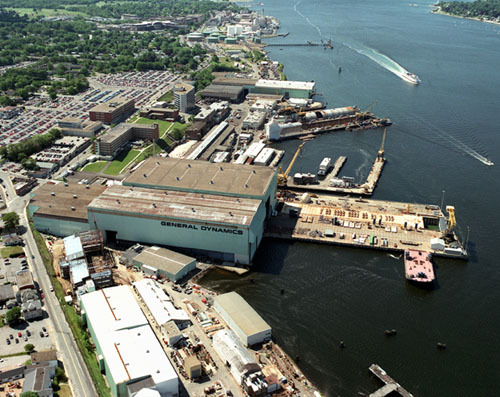 GROTON — Electric Boat, southeastern Connecticut’s giant naval business that employs thousands in the state, ended the year with an expanded payroll and revenues holding firm at around $4 billion. Kevin Poitras, the president of Electric Boat, a division of General Dynamics, spoke confidently about the future of sub-making, even as one round of defense cuts have already hit the Pentagon earlier in 2012 and another waits on the horizon. That being said, he expects budgets for submarine programs to increase inasmuch as they have been identified as vital to the future national defense strategy. And in short-term, Electric Boat’s contracts are coming through. In December, Congress approved spending to continue the usual work on two Virginia-class submarines as well as design work on the Ohio-class replacement submarine. If the across-the-board defense cuts that Congress delayed until March go into effect, it wouldn’t necessarily mean layoffs at Electric Boat, Poitras said. The company could possibly manage cost-savings by simply not filling positions emptied through attrition. The company ended the year with 11,926 employees. Poitras, who took over Electric Boat in May, said that this was the first time in four years that the company has hired in all its divisions, with expectations to hire 300 more tradespeople in Groton to supplement repair work, like the fire-damaged USS Miami. The company also plans to hire about 500 to balance employees lost through attrition. New hires more than compensated for the company’s 2012 layoffs, pushing Electric Boat’s Connecticut employment at the end of the year up by about 500 employees at 8,900 — 6,100 in Groton and 2,800 in New London. “To fully appreciate the impact submarine production has and will continue to have in our region, you have to look not just at 2012’s excellent workforce numbers, but at the future of submarines in our national security strategy,” Congressman Joe Courtney, who represents eastern Connecticut and serves on the House Armed Services Committee, said in a written statement. For 2012, about 61 percent of Electric Boat’s revenues came from production of Virginia-class submarines. Design made up about 28 percent of the company’s revenues, which included preliminary work on an Ohio-class replacement. Maintenance and modernization programs made up 8 percent of revenues. In December, Electric Boat responded to a request for proposals for the fifth block of Virginia-class submarines, which would be built 2014-2023 and generate about $18 billion in future work, Poitras said. These “stretched” versions of the original Virginia-class include an extra 90-foot section for precision-strike, Tomahawk missile capabilities. The company also landed a $390 million research and development contract for the Ohio-class replacement submarine, a program that aims to build 12 submarines that will be in service until 2080 and carry about 70 percent of the country’s deployed nuclear weapons. To state and federal legislators, the message was not unlike the type heard throughout the wider business community: take care of deficit issues, continue to stimulate business development, build on education reform and support jobs. Hank Teskey, Electric Boat’s director of taxes, said that cuts to jobs programs and incentives would have a negative impact on the state and that the company’s future workforce depends on a strong science and math education. This entry was posted in Uncategorized and tagged Electric Boat, Groton, Submarine, USA on January 16, 2013 by jasonlockley.